Massachusetts named 14 community microgrid projects that will each receive grants of $75,000 for microgrid feasibility studies. Here are the project details provided by the Massachusetts Clean Energy Center, following the February 21 announcement. 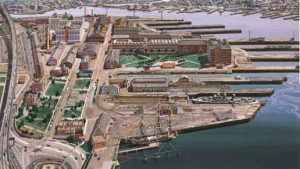 Project Summary: The Charlestown Navy Yard is a high-density area containing over 2 million square feet of academic medical research facilities and an acute rehabilitation hospital. Due to its proximity to Boston Harbor, Charlestown Navy Yard is vulnerable to extreme weather events as a result of exacerbated climate change. The proposed community microgrid would combine existing assets with new solar, energy storage and other control technologies that would provide greater resilience to the hospital and reduce GHG emissions. 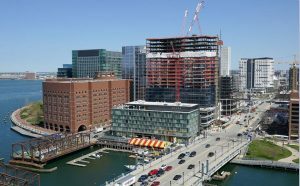 The Charlestown Navy Yard is a high-density area containing over 2 million square feet of academic medical research facilities and an acute rehabilitation hospital. Project Summary: The proposed City of Pittsfield Downtown Microgrid would serve, with uninterrupted sustainable energy, vital facilities that serve the City’s most vulnerable populations alongside critical municipal services. The project represents an opportunity to modernize community energy infrastructure in a Gateway City to provide resilience and attract and retain employers that rely on a high degree of power quality. Project Summary: The CCEP seeks to integrate local renewable energy resources with existing community generation assets to provide lower cost electricity, as well as strengthen the energy infrastructure and resiliency, of the Main South neighborhood, an economically disadvantaged community. The project also seeks to create a replicable community energy model by creating a membership-based cooperative. Project Summary: This proposal involves a community microgrid centered on WIT campus, serving a collection of university students with 72 percent of students requiring need-based scholarships. Population density in neighborhoods adjacent to the project continue to increase, making the project an opportunity to address capacity issues, potentially saving on utility infrastructure upgrade costs. The inclusion of two educational institutions in the proposed project could provide a valuable workforce education opportunity. Project Summary: The prime motives of the project include providing resiliency to the regional IT server hub and emergency services communication, as well as allowing Shaw’s to remain open during an emergency event to protect residents’ access to food and water. Previous grid outages in Melrose have impacted emergency dispatch services located in City Hall, resulting in delayed crisis response time. The city hopes that the microgrid project would help meet GHG emissions reductions goals and move the City toward becoming a net zero community. 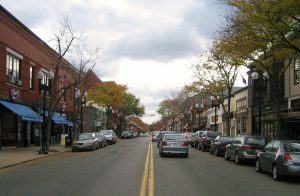 The prime motives of the Downtown Melrose community microgrid project includes providing resiliency to the regional IT server hub and emergency services communication. Project Summary: Residential and commercial projects in Sandwich have been abandoned due to lack of an affordable wastewater solution. The Feasibility Assessment will support development of Cape Cod’s first wastewater treatment facility powered by a community microgrid within the planned Forestdale Village project. In addition to serving the wastewater treatment plant, the proposed microgrid will service senior and low-income housing units, as well as surrounding gas station and convenience stores. Project Summary: The proposed multi-user microgrid will directly support the missions of the Hanscom Air Force Base, MIT’s Lincoln Labs, and LG Hanscom Field (airport) and their ability to assist civil authorities during emergencies and natural disasters. The proposed project would leverage existing generation, including a new 4.6 MW CHP facility, and planned assets on the base/MIT-LL campus, including energy storage and distribution technology. New upcoming construction at HAFB, MIT-LL, and Massport will bring new and higher energy loads online in the coming years, making the proposed microgrid an important step to meet growing energy demands. Project Summary: The town of Hull, located in an area at high-risk of wind and flooding damage from hurricanes and other strong coastal storms, relies on the Hull Light Department MLP for local electric distribution. HLD receives electric power through a single point of interconnection with the regional power system and is highly susceptible to prolonged outages during and after severe weather events. In an effort to ensure energy resilience of critical facilities, the Hull Light Department proposes to use an existing 1.7MW wind turbine and backup diesel generators, along with a new energy storage system and solar, to fuel a microgrid. Project Summary: The RLF Marine Park, a former military base along the South Boston Waterfront, is home to businesses that support over 5,000 jobs as well as various critical facilities like the Boston Harbor Patrol, the MassDOT Highway Operations Center and the Mass Turnpike Authority’s ventilation building. There is urgency to enhance resiliency in the area due to projected sea level rise. The proposed project seeks to assess a community-led microgrid in low-income neighborhoods in the highly-diverse and densely populated city of Chelsea. Project Summary: The proposed project seeks to assess a community-led microgrid in low-income neighborhoods in the highly-diverse and densely populated city of Chelsea. The project includes important critical facilities such as public schools, a health care facility, and the New England Produce Center, the second largest produce distribution center in the country. The project team is strongly committed to modeling a grassroots-driven microgrid project which seeks to address energy justice challenges by engaging politically and economically marginalized communities who are disproportionately affected by high energy costs and the impacts of climate change. South Boston is among the communities to win funding for a microgrid study through the MassCEC Community Microgrids Program. Project Summary: The proposed project would improve energy resiliency in Boston’s Chinatown neighborhood, which is projected to experience regular flooding, assuring reliable transportation and mobile communications, as well as delivery of essential services like food, water, and energy. The proposal includes eight affordable housing complexes. The project team is strongly committed to modeling a grassroots-driven microgrid project which seeks to address energy justice challenges by engaging politically and economically marginalized communities who are disproportionately affected by high energy costs and the impacts of climate change. Project Summary: The proposed project would bring backup power to the supermarket in order to protect the community’s access to food and water, and to the town’s water and wastewater treatment facilities. The project proposes to include the implementation of a planned 1 MW solar array and energy storage system to reduce energy demand challenges and provide emergency power to local critical infrastructure. The proposed project would minimize or eliminate usage of existing backup diesel generation at both the water treatment plant and Stop N’ Shop. Project Summary: Located along the Connecticut River, the town is exposed to severe winter storms that bring heavy snow fall and ice, resulting in extended outages and limited travel. The proposed microgrid project calls for back-up energy supplies for emergency services, such as the fire and police departments, and for emergency shelters, such as the middle and high school. In addition to safety and energy resiliency the proposed project is intended to provide a variety of benefits, such as reduction in energy demand and integration of renewables. Project Summary: This microgrid feasibility study would be conducted by Thorndike Energy for the Town of Palmer, leveraging its existing solar and hydropower assets. The proposed project will support emergency response providers as well as critical facilities, including a regional hospital, local food sources, and a school which could serve as an emergency shelter. Track news about microgrid projects by subscribing to the Microgrid Knowledge newsletter. It’s free.